LAKEPORT, Calif. (AP) — Twin wildfires tearing through vineyards and brushy hills threatened some 10,000 homes Tuesday in Northern California — yet another front in the battle against the flames that have ravaged some of the state's most scenic areas. The two fires straddling Mendocino and Lake counties had burned seven homes along 116 square miles (300 square kilometers) of rural land. Fire crews were able to slow the spread of one of the blazes into populated areas and instead the fire pushed into the Mendocino National Forest. About 100 miles (160 kilometers) north, the so-called Carr Fire that has burned more than 880 homes and killed six people has become the ninth most destructive wildfire in California history, said Scott McLean, a spokesman for the California Department of Forestry and Fire Protection. In Lake County, evacuation orders were in effect for the 4,700-resident town of Lakeport along with some smaller communities and a section of the national forest. 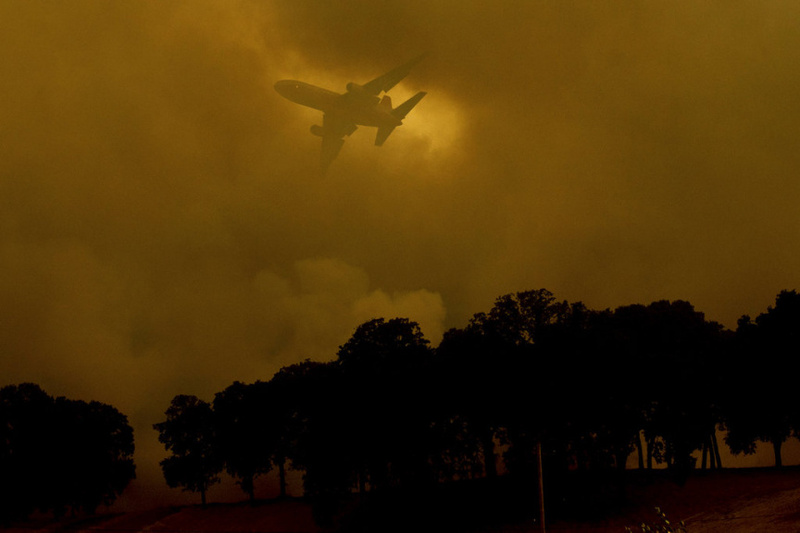 In all, some 15,000 people have been warned to flee, fire officials said. A few miles away embers, ash and smoke swirled through vineyards where at least one home had gone up in flames. Firefighters set blazes at the bottom of hills in order to burn up the tinder-dry brush before flames cresting the ridge tops could feed on it and surge downhill. A fleet of aircraft made continuous water and fire retardant drops, filling the air with the roar of their engines. The blaze, which killed two firefighters and four civilians including two children, has also destroyed 311 outbuildings and damaged 165 homes, McLean said. More than 27,000 people remained evacuated from their homes, although another 10,000 were allowed to return Monday as fire crews reinforced lines on the western end of the Carr Fire. Firefighters from 10 other states are helping to battle the blazes, with six more states expected to send firefighting resources to California this week. Thanawala reported from San Francisco. Associated Press writers Lorin Eleni Gill and Olga R. Rodriguez also contributed to this report.